Mr. Ben is napping and I am getting ready to go out, so Faith took it upon herself to make a lunch. Sounds good to me! She also requested I take pictures and post it, so here you go! 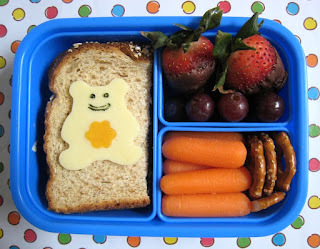 She made a cream cheese and jelly sandwich on Honey 7-Grain bread and decorated it with a teddy bear. She drew the face with food-safe markers. To the right, she has a couple of chocolate covered strawberries and grapes from her Valentine's fruit bouquet, carrot sticks, and pretzels. I'm impressed! I'm impressed too! Great job, Faith! Great Job! The food-safe markers are my kids favorite! Awesome lunch! The teddy is so cute :D Well done Faith! Wow! Faith is super-good at this. What a fun skill to pass on to your daughter. Shannon- I am wondering if Bento lunches would be best for my twins' Mothers Day Out lunches. Do they make containers with lids for easy travel? Where do I begin?